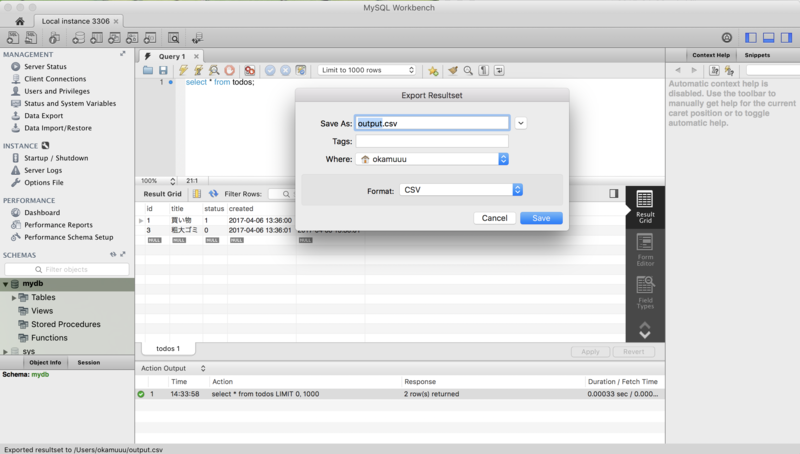 If you can use MacOSX, you use brew install mysql command. If you can use MacOSX, you use brew install mysql command. After installing it, check the version. My situation was 5.7.17. You can run and stop MySQL using the command like bellow. If you installed MySQL and change something, you can log in as root user without password. Let's show databases already exits. Let's show a table user. Then, the columns are too long to see, So change the semicolon to ¥G. It will be easy to see. run the command exit; and stop the interactive mode. Other ways, you can use command line interface. Let's start interactive mode. You can specify which database use at this point. It is as same as below. You can create and drop table just run below command. So you can retry this tutorial many times. Let's s select some records, not complete tasks. Then finished cooking, update the task to complete. Let's delete the record. I recommend selecting the record just before delete it. Because if you forgot to specify where id = 2. The records will be gone in todos table. This is just an example; we accidentally delete all records. You can specify pager, seeing many columns record. Anyway, you want to copy the terminal character; there is a way to change the output to file from terminal. Sometimes my coworker asks me to get CSV data from a database. There are many ways; my recommendation is using tools like a MySQL Workbench. What I think is it okay to forgot the pager and CSV. Just Please keep that in your mind.